Wait, I Can Easily Get a Railing Price Now? It's March - Time to Talk Brackets! Do You Know your Code? Part Three Examining 20 MORE Railing Terms Railings and Beer.....a Perfect Match? Working with railing can often get confusing, especially when very specific terms start to get thrown around. We have already looked at 20 common railing terms, but now it's time to check out 20 more! 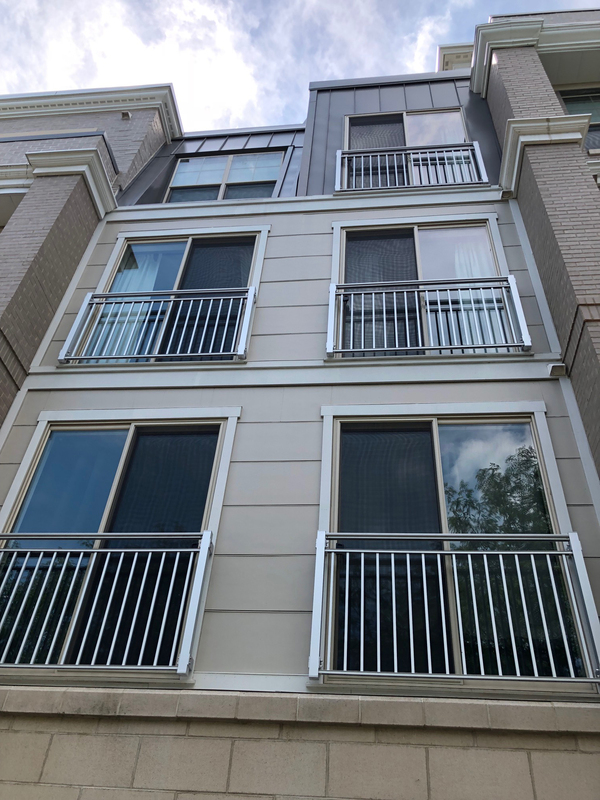 Last year, we took a look at 20 common aluminum railing terms in order to provide a better understanding of the terminology associated with a product more complex than it appears on the surface. Today we will take a look at even more railing terms (yes there really are MORE railing terms). If you are seeking more info on terms associated with other similar products, be sure to check out our look at terms regarding columns and fence! 1. Pipe Cable Railing: A railing system that utilizes pipe components (such as those used in pipe picket railing) but replaces standard infills with horizontal cables. 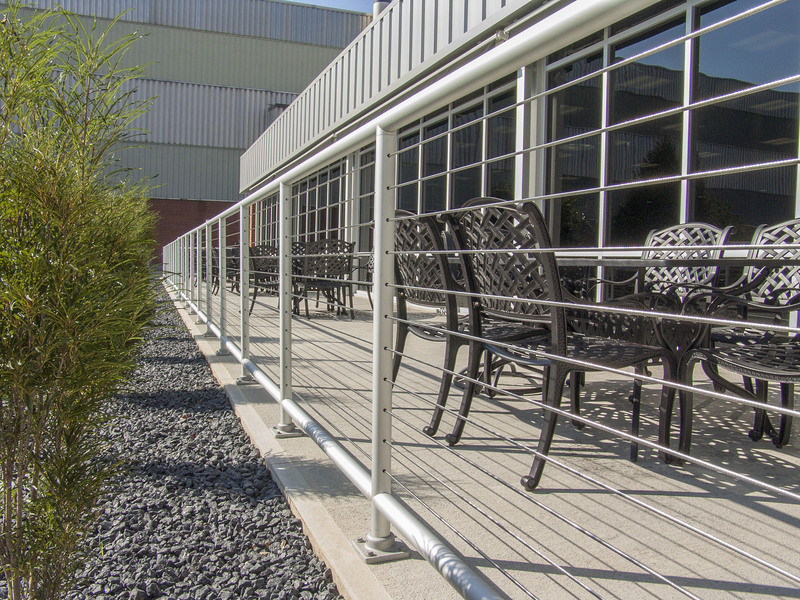 The cables provide a modern commercial look to the pipe railing while also creating an unimpeded view. 2. Juliet Railing: Railing covering a large window or doorway that does not lead to a balcony, typically in a large apartment complex. Allows the owner to freely open windows/doors wide while remaining safe. Typically, this type of setup is called a “Juliet Balcony” despite no actual balcony being present. 3. Radius Railing: Pipe railing bent during assembly (in house at Superior) to fit around corners or other angles. Typically utilized for circular areas such as water tanks or curved ramps. 4. Mechanical Fasteners: Fasteners inserted into the openings in pipe railing and sealed with epoxy. These can either be straight or angled as needed. 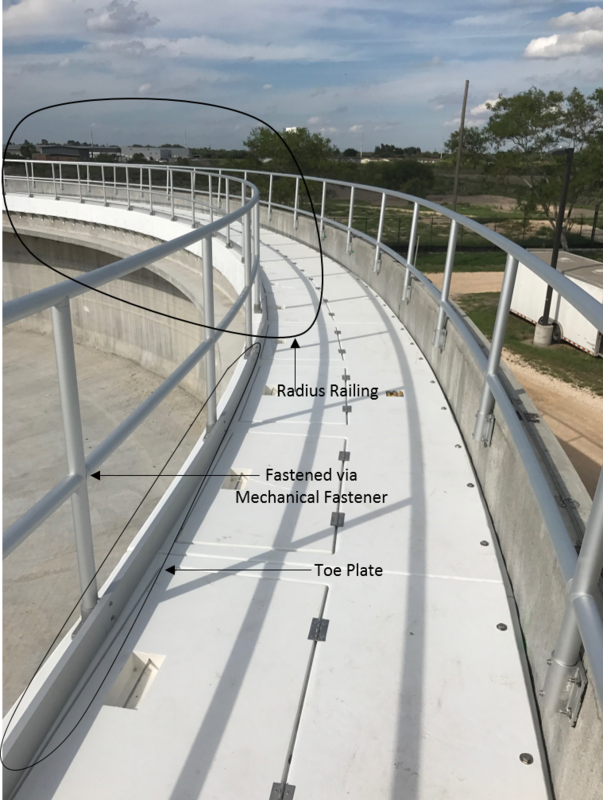 The utilization of mechanical fasteners allows for a continuous railing section instead of one segmented by a bracket or weld. 5. Toe Plate: A solid piece of metal attached to the bottom of a given railing segment used to prevent items from falling and rolling into the railed off area. Very common in water treatment plants and ADA ramps to meet code requirements. 6. End Post: A post that sits at the end of a railing run. If a pocket post, there will only be pockets on the railing side of the post. 7. Section Post: A post that sits in the middle of a railing run. If a pocket post, there will be pockets on opposite sides of the post. 8. Corner Post: A post positioned at a turn of a railing run. If a pocket post, there will be pockets on two (or three) adjacent sides of the post. 10. Four-Hole Tab: A pre-drilled tab used to finish securing top railing in pocket posts. Installed before caps are placed. 11. Swivel Bracket: A bracket utilized in square post railing that attaches top or bottom rail to a post and allows the railing system to swivel up and down for stairs or ramps (or in some cases, a horizontal swivel bracket can be used for turns). 12. Crossover Cap: A cap utilized in some sections posts to continue a top rail run without stopping for a post. 13. Base-Mounted Railing: The most common method of mounting railing. A base (typically square) is anchored to the ground to secure the railing after drilling into the material that railing is being secured to. Applicable with round or square railing posts. 14. 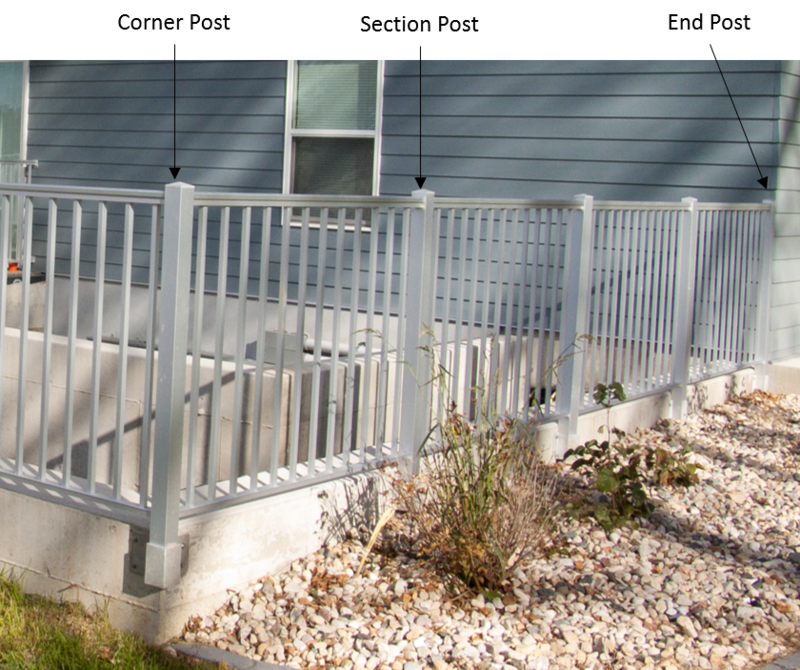 Side-Mounted Railing: Popular in areas with low amounts of surface area for mounting such as elevated decks or Juliet railing. Railing is anchored to the side of a structure rather than the top. Applicable with round or square railing posts. 15. Embedded Railing: Railing posts are built with extra length in order to cement posts into concrete (or the earth) as opposed to a surface. Applicable with round or square railing posts. 16. Heavy-Duty Base: Applicable for base-mounted railing. Typically welded on and engineered to be usable in areas with heavy-load requirements such as high balconies. Applicable for round and square posts. 17. Stringer-Mount Base: A narrow version of the heavy-duty base utilized on stair stringers. Only valid in base-mounting scenarios. 18. 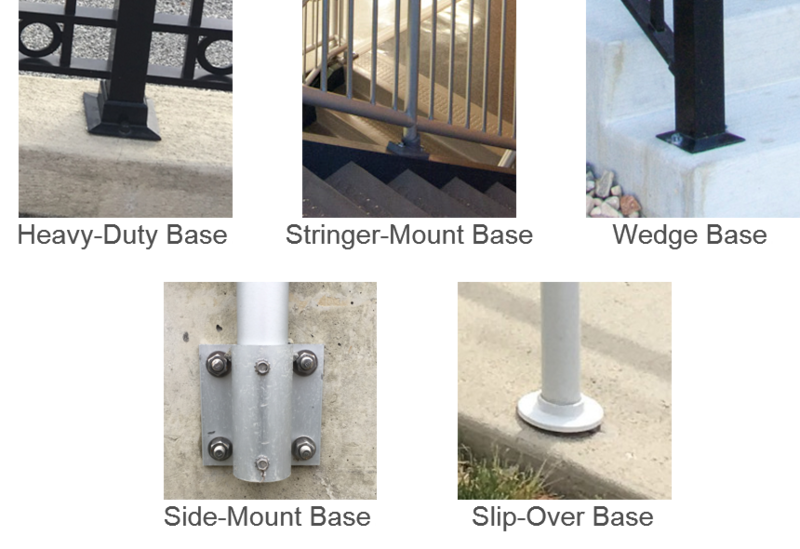 Wedge Base: A simple square base fastened to square post railing often utilized in residential or ground level settings as a base-mounted option. 19. Side-Mount Base: An opening at the top of the base allows the post to slide in and be fastened to the base for side-mount applications. The base generally has side flaps that can then be attached to whatever surface is being utilized. 20. Slip-Over Base: Utilized in embedded applications, this slides over the post before insertion into the embedded location. It is mainly for aesthetic purposes. While we hope this has allowed for a deeper look into the railing world, we do not expect anyone to become an expert just from reading this list…. that is what we are here for! We are happy to help answer any railing questions or assist in designing your next aluminum railing project. Just give us a call at 800-548-8656 or contact us here!